Famous for: History, Holy kunds, Seeking Experience and religious significance. Entrance Fee: Free entrance for everyone. Visiting Time: 5 am to 9 pm, all 7 days a week. Galta Ji is a very famous temple and a highly-regarded pilgrimage for the Hindus. This beautiful temple built out of pink rocks and wonderfully sculpted by to notch artisans is one of the best places to visit in the pink city. This temple is known for the positive energy that people feel here, healing and motivating them during their visit here. 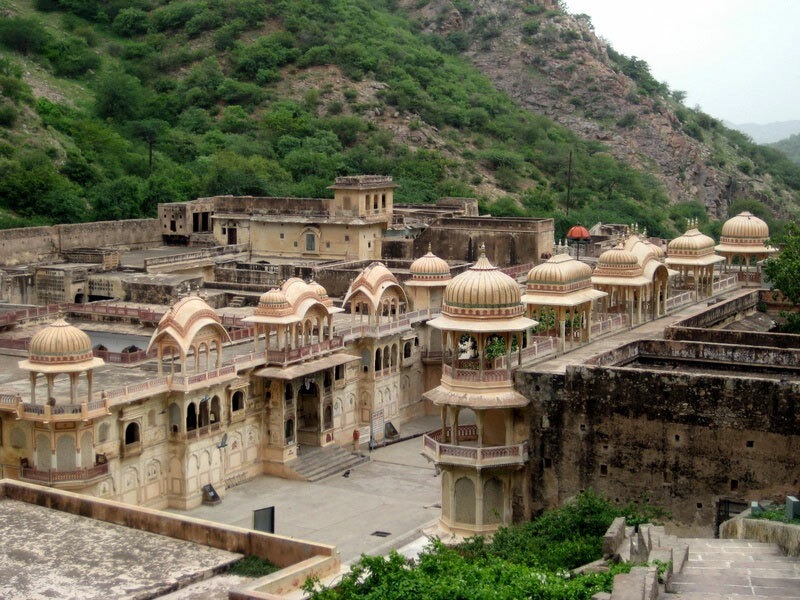 Set near the sprawling Aravali this temple has seven kunds which are regarded as reservoirs of holy water and are filled by the waterfalls and streams nearby. 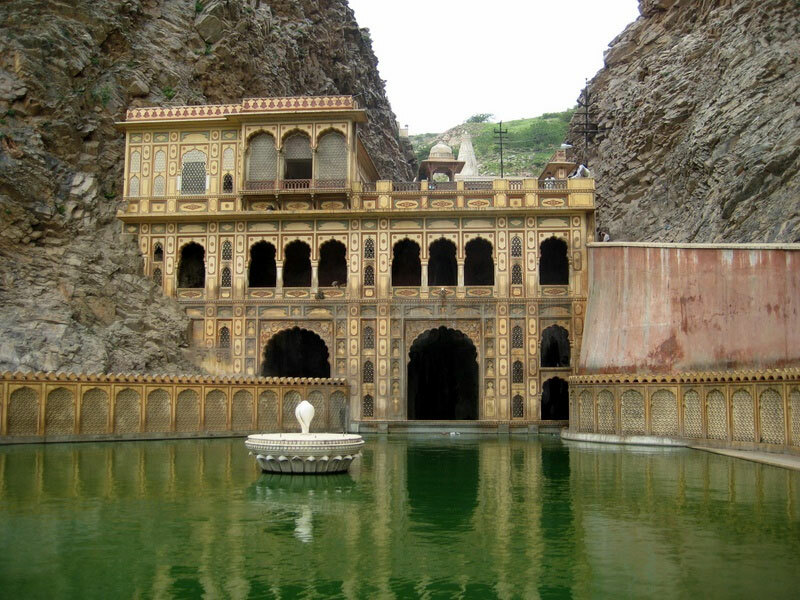 Galta temple has great historic significance and is one of the most visited places in the pink city. The sculptures and paintings are something that portray magnificent beauty and capture the essence of the temple. The temple is surrounded by natural beauty and is surely the perfect place for any nature lover. Since it is a well-known temple a lot of people are going to be there all the time, so make sure to leave your footwear at the allotted place to avoid theft and misplacing your footwear. Make sure you don’t hamper the water in the kunds as well as not drink the water since it might not be clean enough to be drunk. There are a lot of monkeys in the area, so keep your belongings safe. Take a dip in the holy waters of the kunds. Watch the beautiful sunset from the sun temple. Feed peanuts and bananas to the playful monkeys. The best time to visit this place is around min-January as there is a huge gathering and a lot of people visit the temple on the auspicious occasion of Makar Sakranti. Evenings are beautiful here, and even the monkeys come out to play during the time. Located about 10 kms from the pink city one can either hire a cab to drop them to this amazing temple or take a bus that’ll drop them at Vidyadharji ka Bagh. From there one can hire an auto rickshaw that’ll drop them at the temple. The temple was built in the 18th century and since then has been one of the pilgrim sites for the Hindus. The temple was built under the supervision of Diwan Rao Kriparam who was an attendant to Sawai Jai Singh. A saint named Saint Galav is said to have spent 100 years here doing his tapasya and as a tribute a temple is named after him. The water in the kunds are considered to be holy and never dry out. Taking a dip in these waters is said cleanse all the sins of a person. This temple is adorned with beautiful architecture and paintings on the walls and pillars that give people an idea of the Hindu Mythology. Galta Ji is a dwelling ground for a number of monkey tribes that happen to be very friendly with tourists. The sunsets from the sun temple is phenomenal and is a must watch while visiting Jaipur. A wonderful piece of the Indian culture and heritage this temple is one of the most visited places in Jaipur city. One can feel the aura of calmness here and can sense the supernatural. The rich history that India has is what these walls contain and have seen India in its best and worst. Galta Ji is one pilgrim site that every Hindu wishes to visit. Not only religious followers but this place is visited by hundreds of people every day who want to know more about India and want to see the relics of Indian history.